Beware the Kooksoo's are out! From the coldness of Antarctica to the heat of Australia this animal is 2 inches tall and 4 inches long but is the deadliest thing out there. It has a tiny black body which it uses to blend in with it's surroundings, a very strong beack to eat its prey and just warning you, this animal is not a vegetarian! It has two back legs which help it run faster than ever so if you see this animal please report it to the animal control and do not go near it or you will find your self in quite a pickle and probably won't live. Another thing you shouldn't do is say it is cute to its face, if you do you will find yourself in the same situation as above. The Kooksoo's beack is bigger than its face and it has a black body with the smallest feathers. It has four legs but when it runs it only uses its back legs to run it uses its front legs to steer. 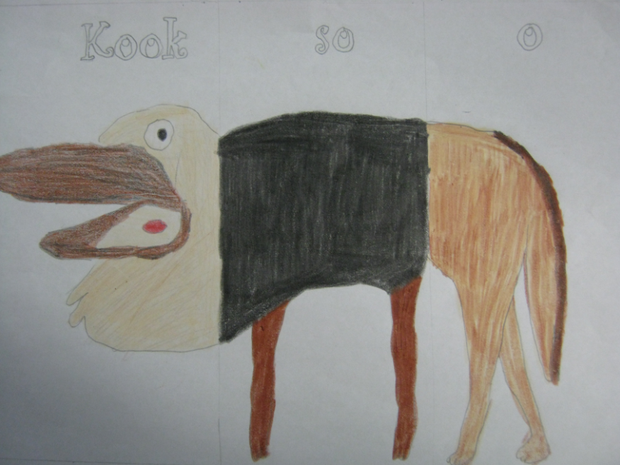 It has a long tail to trip people over so it can eat them, you may be wondering how it eats the whole thing its self, well, it dosn't it uses its beack to call other Kooksoo's and so they come to that place and have almost a feast. This is a picture drawn by Dr Runaway who was the last to see the Kooksoo. If you happen to come across this animal stay calm and please report it to the Animal Patrol.